Hi, i downloaded the software last night and i try to export my key and overtime i double click the file it comes up with a error that says ''1 key processed0 imported '' i don't know what is wrong or why this error keeps popping up but how do i fix it ? What you are seeing isn't an error but actually a message showing the results of your attempted key import. 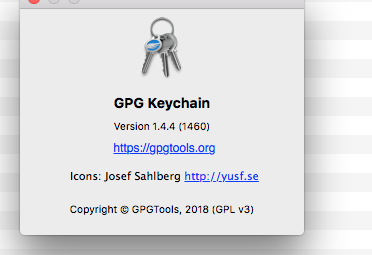 You double clicked the key and since GPG Keychain was open at that time it is trying to be smart, assuming you are trying to import the key file. It then sees that the key you are trying to import (your own key) already resides in GPG Keychain thus it informs you that 1 key was processed but 0 imported.